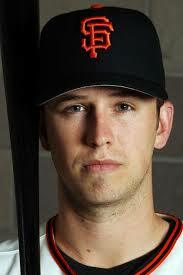 Buster Posey. 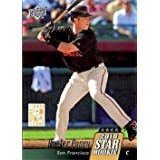 Gerald Dempsey "Buster" Posey III, the oldest of four children, was born to Gerald Dempsey "Buster" Posey II and Traci Posey on March 27, 1987, in Leesburg, Georgia. His nickname, "Buster," came from his father's childhood nickname. Buster played football, soccer, and basketball growing up, but baseball was his first love. As a junior at Lee County High School, he pitched and played shortstop. That year he hit 9 doubles, 3 triples, and 7 home runs while setting school records for batting average (.544) and runs batted in (46). His pitching achievements included a 10–1 record and a 1.53 ERA. In his senior year, he batted .462 with 40 RBI while setting a school record with 14 home runs. In 13 starts as a pitcher that year, he had a 12–0 record with a 1.06 ERA and 108 strikeouts. His Lee County team was defeated by Henry County High In the Georgia AAAA State Championship. Following his senior season, Posey was named the Georgia Gatorade Player of the Year, the Louisville Slugger State Player of the Year, an EA Sports All-American, and a Baseball America All-American. He graduated with a 3.94 grade point average in high school, fourth in his class of 302 students and, although he was drafted in the 50th round of the 2005 Major League Baseball Draft by the Los Angeles Angels of Anaheim, he chose to enroll in college instead. As a freshman for the Florida State Seminoles under coach Mike Martin, Posey played shortstop, starting all 65 games for the Seminoles. He finished his freshman season with a .346 batting average, four home runs and 48 RBI and was named a Louisville Slugger Freshman All-American. As a sophomore, Posey moved to the catcher position on the suggestion of assistant coach Mike Martin, Jr. He batted .382 with three home runs and 65 RBI and, after just one season of playing the position, he finished second to Ed Easley in Johnny Bench Award voting, an award that goes to the best catcher in the National Collegiate Athletic Association's Division I. In 2008, as a junior, he hit .463 with 26 home runs and 93 RBI, won the Johnny Bench Award as well as the Collegiate Baseball Player of the Year award. On May 12, he hit a grand slam and played all nine fielding positions in a 10–0 victory over Savannah State University. During the college offseason, Buster started at shortstop for the Yarmouth-Dennis Red Sox in 2006 when they won the Cape Cod Baseball League championship. In 2007, they won again with Buster playing catcher. Considered by Baseball America to be the best catcher available in the 2008 Draft, Buster was taken by the San Francisco Giants with the fifth overall pick. On August 16, shortly before the signing deadline, the Giants signed him a $6.2 million bonus. It was the largest up-front bonus in Giants history. Entering the 2009 season, Baseball America ranked him the number two prospect in the Giants' organization behind Madison Bumgarner. 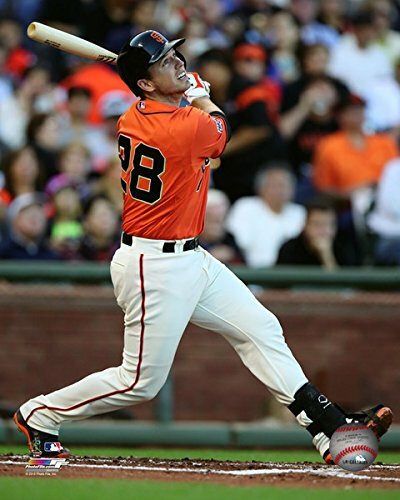 Following spring training in 2009, Posey was assigned to the Giants' Class A Advanced affiliate, the San Jose Giants of the California League. In 80 games with San Jose, he batted .326 with 63 runs, 95 hits, 23 doubles, 13 home runs, and 58 RBI. Buster was brought up briefly toward the end of the 2009 season. He had 2 hits in 17 at-bats. He was called up again on May 29, 2010, and started at first base against the Arizona Diamondbacks. He drove in the first runs of his major league career, going three for four with three RBIs. He appeared primarily at first base through the end of June. Then, following Molina's trade to the Texas Rangers on June 30, Posey became the starting catcher for the Giants. As a rookie, he finished with a .305 batting average, 18 home runs, and 67 runs batted in and was named the National League Rookie of the Year. He caught every inning of the playoffs as the Giants won the 2010 World Series. He missed most of the 2011 season after he being severely injured in a collision with Scott Cousins at home plate. Returning from his injury in 2012, Buster posted a .336 batting average winning the 2012 NL batting title. He became the second San Francisco Giant to win the batting title and was named the NL Most Valuable Player. He won his second World Series that year as the Giants swept the Detroit Tigers in four games. 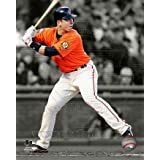 On March 29, 2013, Posey signed a 9-year contract extension worth $167 million, a record in sum and in length for a player with his level of experience. 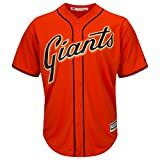 He won his third World Series the following year as the Giants defeated the Kansas City Royals. In 2016, he won his first Gold Glove award after an excellent defensive season.1 For his career stats, click here.